Dual voltage (230V-110V) 50W 4000lm. Compact and lightweight with a tough polycarbonate casing. Features ultra bright LEDs that do not overheat, ideal for use in extreme working environments -20ºC to + 60ºC. 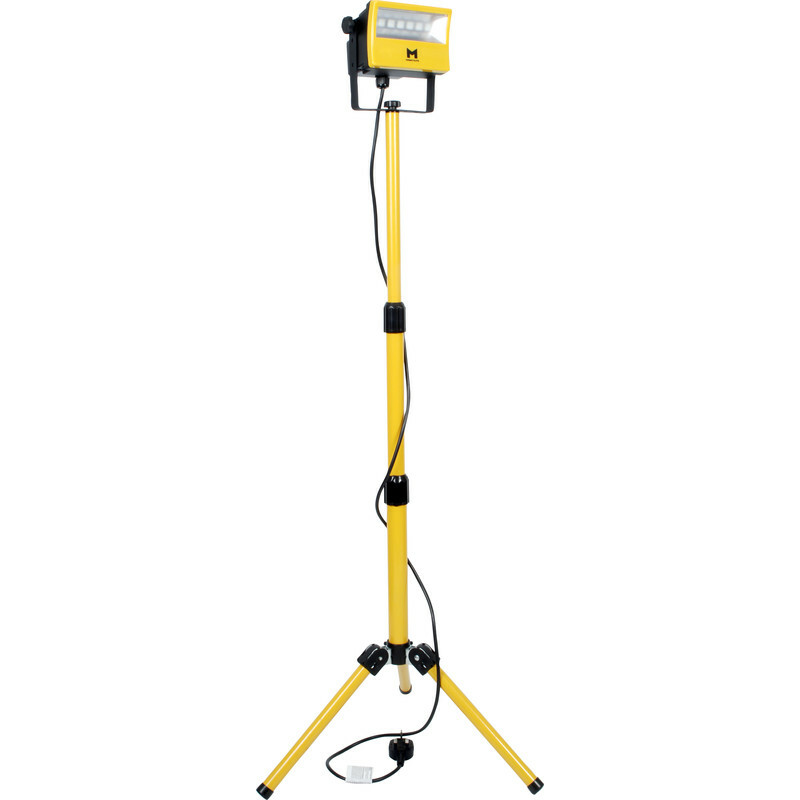 Includes 1.4m Tripod and bracket, 2m lead and 230V standard 3 pin Plug. Requires plug for 110V use 35522 not supplied. 230V 50W LED Tripod Work Light 4000lm is rated 4.3 out of 5 by 11. Rated 5 out of 5 by Chris47 from Nice bit of kit. Good quality,easy to assemble. Sturdy to use. Very bright. Ideal for a workshop or garage. Rated 4 out of 5 by Lyuse from Light and Bright Easily assembled although parts supplied don't match the instructions. No mention of the black plastic spacers necessary to provide friction for the tiltable head. Astonishingly, the tapped holes in the head for the friction knobs were drilled out of true, as if done by eye rather than on a machine, so the knobs are not quite at right angles to the head. This doesn't affect the operation but seems shoddy. Rated 4 out of 5 by Mjps from Super bright work light I bought this to light up a corridor I was working on and it's very good, does get warm but not like a halogen. One great aspect is how small it folds up. Very stable. I am going to extend the lead as it's too short without an extension lead. Rated 5 out of 5 by Egg man from Excellent work light. This has to be one of the best work lights out there, it light a whole room up no problem, doesn't get red hot like the halogen ones. The stand has 2 settings for the feet, so if space is a bit tight you can have them on narrowest setting and its still fairly stable. It can run off 240v or 110v if used around building site which is a great feature. Rated 5 out of 5 by Renovation from Really good lights My third one. Used for detailed painting in dull rooms. Rated 1 out of 5 by Richard2017 from not so reliable as expected It was great when it works, after two month normal usage, it refuse to turn on. returned it on 29/06/2017, still waiting for the refund today, almost half month passed, very disappointed by the service. Rated 4 out of 5 by ThunderGuts from Bright, well engineered, useful IP rating Bought to replace an old halogen unit. It's bright although while I'm sure it kicks out the lumens it says, the figure is quite low given the wattage. Good even light spread and the two stage tripod legs are useful. Outdoor rating is good but the included flex is very short. Quite expensive but a decent light. Rated 4 out of 5 by Ilya from Needs improvement for 5* rating Good tripod compared to other models. The light head would benefit from a switch otherwise you would have to reach for the mains plug every time you want to switch light off for a short time.